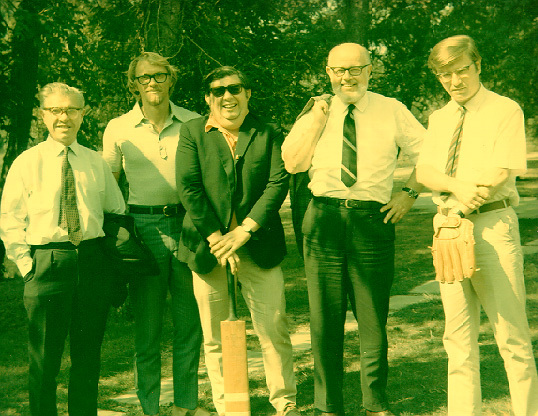 At Institute of Theoretical Astronomy, Cambridge UK, in July 1970, Fred Hoyle, Donald Clayton, Geoffrey Burbidge, Willy Fowler, and Wallace Sargent. This group (plus Margaret Burbidge and Phil Solomon) comprised the "American" core of Hoyle's visiting staff at IOTA during 1967-72. This was the fourth summer of IOTA's existence. Burbidge felt himself to be the right one to represent cricket, which was avidly watched during these summers, especially during Test Matches. Certainly his stance with the bat looks convincing. But Hoyle was a keen expert, and his TV was often the site of Test-Match watches. Department of Physics and Astronomy © 1999. All rights reserved.